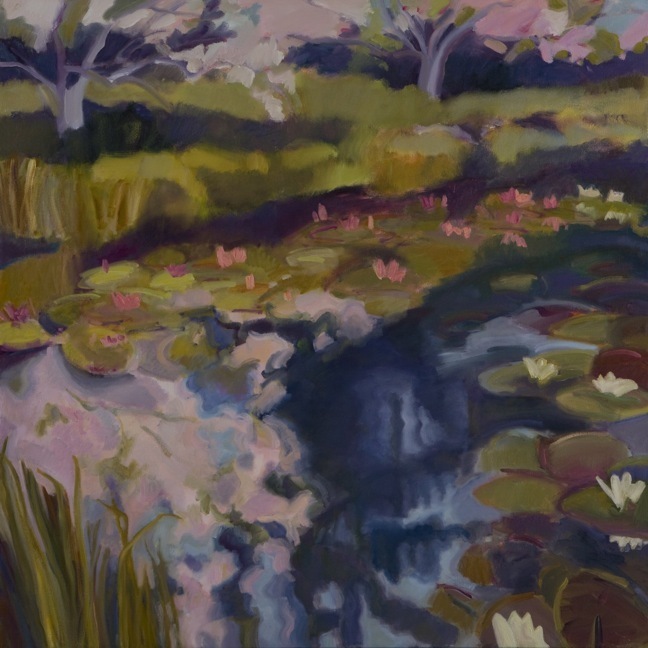 The Pond in Bloom oils were painted “en plein air” in Northern California, where I’ve lived since 1974. Painted for a solo exhibit in the months after a soulful winter, they grapple with the theme of renewal. It was a poignantly beautiful spring. Apple trees in bloom and water lilies opening, having long associations with both the Biblical Garden and Eastern religions’ transcendent realms, called to me as subjects. More than “picture-making”, my painting process embodies subjects, enters their life stories, dances their gestures onto canvas, reaches from earth and mud, through water, to sun and sky. The large scale demands engagement of the whole body, the bend and reach from below the knees to above the head, plié and relevé. The energy and rhythm of moving paint over a large terrain keeps me from the distraction of small details. I try to keep the painterly quality and vigor of the initial exploration, while building luminosity with glazed and scumbled transparent overlays of color. Over time there may be return visits to a site and more meditative painting in the studio. This can evoke a new place of some mystery to me, a place of the heart and healing.